For the census-designated place in Mohave County, see Desert Hills, Arizona. Desert Hills is an unincorporated community in Maricopa County, Arizona, United States. Sitting on over 4.31 sq. mi. 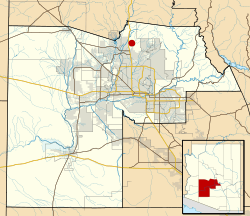 of the 85086 Zip Code, And the (623) Area Code, forming the southern boundary of Anthem and the western boundary of Cave Creek: about 30 miles (48 km) north of downtown Phoenix. Located east of the I-17, Desert Hills is roughly bounded by 35th Avenue to the west, Desert Hills Drive to the north, 28th Street to the east. The majority of Desert Hills sits north of Carefree Highway, however, a small portion resides south from Central Avenue to the west to 14th Street to the east: and south for one mile to Dove Valley Road. Note a community known as Tramonto, falls within these boundaries but is considered part of Phoenix. In the mid-1950s the Lee Ackerman Investment Company of Phoenix promoted this area which was then without water, electricity or any human habitation. They surveyed the land, marked off five or ten-acre parcels and bladed primitive roads through the desert. They marketed the parcels with heavy advertising (e.g. full page ads in the Arizona Republic) and high-pressure sales practices. Parcels were sold for ten percent down with a ten-year contract. Parcels were not claimed to be habitable home sites but rather, long-term land investments. It is interesting to note some 60 years later that, with the start it had, we find a relatively healthy community . The once-nameless rural area got its name from a .25 square mile community on the northwest corner of 7th Street and Joy Ranch Road, consisting of million dollar housing, the rest of the area is largely horse farms, no crop farms as the land is not fertile enough for farming. Desert Hills, Maricopa County, Arizona Facts for Kids. Kiddle Encyclopedia.